The Briefcase is something we cannot live without sometimes and it is about time somebody made one in SL. Petit Chat's My Briefcase comes not just in Black, but a variety of colors of fantasy! Let's start with the Black. 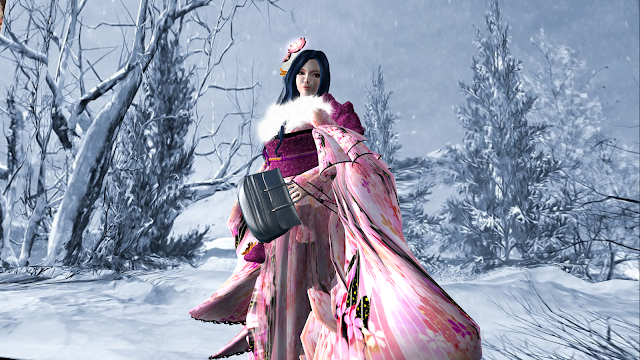 Although is does not seems perfect for the Kimono, Kitty is trying to assure you that it is of good build and even the snowy weather is not an issue! No collection is complete without the Red and it seems that the Red Leather Briefcase does goes pretty well with Kitty's Kimono. There are quite a few more colors and Kitty will show you one more which is the Dark Blue and you can see it is well suited for many many outfit because of its dark and neutral color. Grab it before everyone else!